On June 14, 2012 the world lost a great peace activist, scholar and scientist. I lost a friend and constant source inspiration when Rosalie died at the age of 83 years. She was frail from birth, constantly struggling against severe illness, but her spirit and mind were strong and courageous to the end. Her sisters wrote that, “Despite her illness, she remained in good spirits and most interested in all of the works of justice she strove to support throughout her life right to the end. She died very peacefully.” ”A friend calls her “fuerza companera! !” She was indeed a forceful companion in the work to create a better work. Rosalie had joint citizenship because she had a Canadian mother who was her inspiration and active supporter in social action. From her American father – the inventor of the car night mirror – she developed her scientific and practical abilities. Rosalie knew from a young age that she would enter a convent and take the religious life, much as she enjoyed her home, school and social life. She was in her teens at the end of WW2 and the war “challenged her beliefs about the goodness of the universe…the victory achieved through atomic fire in Japan raised questions that would preoccupy her throughout her life.” Her father, on a church investment committee after the war, refused to allow it to invest in the nuclear industry. Rosalie believes that the war never ended – that post-WW2, the USA and most of the world continue to arm and create a permanent war economy and mentality. She said our society was addicted to war. Rosalie studied biometrics and gained a PhD (critics love to call her Sister Bertell, just a woman and a nun, not a real scientist.) Her concerns about the unleashing of atomic energy and weaponry on the world continued in her research and teaching career, she did original and ground breaking work connecting cancer to nuclear installations and low level radiation. She joined the Grey Nuns, an order with a historic tradition of social service which provided her with security and spiritual support. A devout Christian and nun, Rosalie was never pious or preachy and rarely spoke about her faith. I was touched when she told me she prayed for me when I went to Iraq in 2001 on a medical aid mission. We were together at a women’s conference when she learned she had won the prestigious Right Livelihood Award of Sweden with her co-researcher Alice Stuart of the UK in 1986 and we went to a celebration of that honour at the Swedish embassy in Ottawa. In 1995 we were together at a workshop at the UN Women’s Forum in Beijing where she made the unforgettable statement, “We can be our own media”. 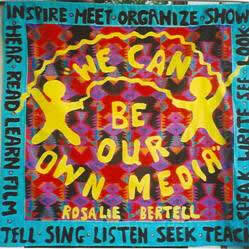 I made those words into a banner; 17 years later the prophecy of those words is seen our independent media and the use of the electronic media. Rosalie’s dedication to her work took her from the islands of the South Pacific to Chernobyl to Bhopal in India and all over North America and much of the world; as a scientist and an activist her life was illuminated by her concern for the health of humanity and all life forms and the destructive effects of radioactivity. I last visited her in 2004, she was anxious to cast her vote in the Canadian federal election, even though by then she had returned to the USA and was recovering from surgery that caused her to lose 15 cm of height in her already slight frame. If she was in pain, she never mentioned it. She was grateful to live in the protection of the mother house of her order with a well-equipped office where she never stopped working. Her first book, No Immediate Danger: Prognosis for a Radioactive Earth was about the dangers of radiation and the cover-up of this major threat to health. 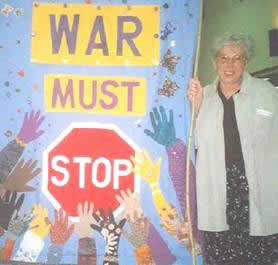 She wrote and co-authored many articles and reports and her last solo book: Planet Earth: The latest weapon of war (also reviewed on www.bbcf.ca) was published in 2000 and it was the culmination of her experience as a researcher and activist. In it she reviews her work and experience leading to her conclusion that relentless blind militarization is our greatest threat to the earth’s environment and life – totally constructed by humans and certainly possible to change and deconstruct. In Planet Earth Rosalie is optimistic about the possibility for change. She points out that our society has changed its core values – also attitudes and legislation- on many issues from women’s rights, children’s rights, animal welfare and homosexual rights. She believes we can and will change our values about militarization. Thank you dear Rosalie, you remain part of that beautiful creation.